500 - Bracket for Wall Mounting; Please specify model & color. 520 - Casters (set of 4) Factory Installed- Not for MG Models. 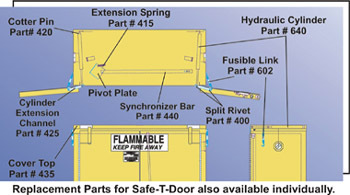 Convert any non-weatherproof standard door cabinet into a Safe-T-Door model with Securall Retrofit Self-Closing Kit. Kit comes ready to install and all parts are replaceable with easy cover plate access. Note - Retrofit Self-Closing Kit can not be installed on a weatherproof cabinet. All Securall cabinets come standard with 2” Flash Arrestor Vents and bung plug for optional venting. Contact your local authority having jurisdiction for venting regulations in your area.